Find the perfect wind turbine for your clean energy project as we take a close look at 7 of the best small wind turbines available right now. Wind turbines are a great method of supplying renewable energy to your home. When set-up in favorable conditions they can provide clean energy in the most satisfying way. Today we take a look at the best residential wind turbines available right now. How do home wind turbine kits work? What's inside home wind turbine kits? 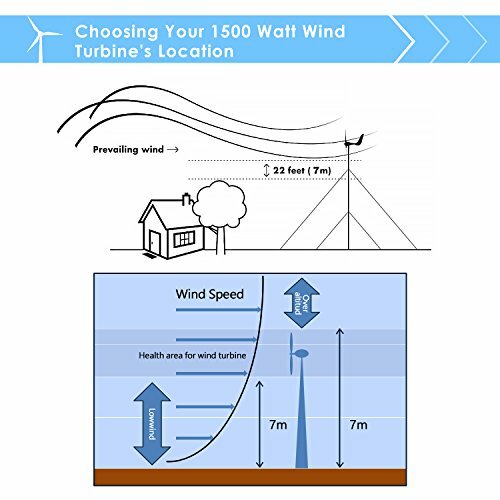 How do I know if a wind turbine will work where I live? Check out the comparison table where you can quickly compare the key features before we review each recommended model in more detail. We’ve included residential wind power kits that start at 300 watts and go all the way up to 1600 watts. If you’re new to the world of wind turbines then don’t miss our guide either. We discuss everything you to know about small windmill generators before you buy. To check the latest price just click on the image. The table can be sorted in each category. Cut-in speed: This is the wind speed at which the wind turbine first starts making energy. Now, we discuss each of the models featured in the table in a bit more detail. 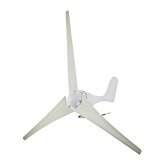 If you’re installing your first small wind turbine, or just need something that’s straightforward to set-up and run, then we recommend the Windmill/Automaxx models. We start with the 1500 watt model, but we also include 1200 and 600-watt models that run really nicely too. The Windmill 1500W is one of the most powerful wind generator kits we have looked at. It comes rated at 1500 watts and has a rotor diameter of 1.7 meters. This larger sized rotor means it has a bigger wind catchment area and a pretty low cut-in speed too. The cut-in speed (the speed of the wind at which it starts producing energy) is just 5.6mph, so energy can be generated with relatively light winds. It also features an automatic braking system, which protects the system against sudden gusts of wind that can cause damaging voltage surges. 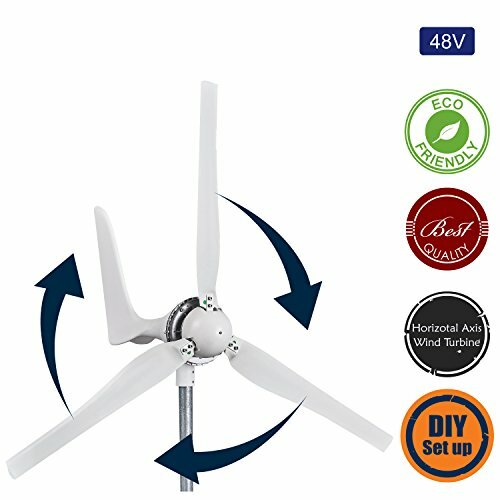 Windmill suggest a battery capacity of 200A for this model and a 24V system. A nice feature with this package is the inclusion of an MPPT charge controller. The controller is an integral part of a solar or wind installation, and MPPT systems are the most efficient type available. Efficiency is king in the renewable energy world, and these controllers typically run at 94-98% efficiency. Besides ensuring the system runs optimally, the controller ensures that the batteries are charged properly. The unit is made from high-quality polypropylene and glass fiber material and is finished with a weather resistant coating. It is easily installed and can be hooked up to solar panel units with relative ease. All that is needed to complete your wind turbine set-up is the pole and a battery pack. This model also comes with a handy 1-year full warranty. Bottom Line: In our opinion, this is one of the best residential wind turbine kits available. The inclusion of a charge controller that is optimized for this turbine makes installation much more straightforward. This mini wind turbine from VEVOR is rated at 400 watts for 12-volt batteries. It’s a popular entry-level model due to its relatively small size, and the inclusion of a hybrid controller. The fact that it is so reasonably well priced doesn’t hurt either. The turbine’s size makes it perfect for smaller off-grid installations or even marine use. It’s most commonly used in the 400 W size but actually comes in variations reaching as much as 1500 watts. The blades are made from an aluminum alloy which makes them very strong but also very lightweight. The fittings are made from stainless steel, so should stand up to the wet weather with no problems. The fact that the turbine is so lightweight means that it needs very little wind to start turning and producing energy. It starts at just 2.5 meters/second or 5.5 mph and runs with very little vibration or noise. It comes with a 20A hybrid charge controller, but the quality of the controller doesn’t match that of the turbine. The controller isn’t well equipped to deal with low wind conditions, so if the wind levels in your area are on the marginal side then a better model would be needed. Bottom Line: Another really nice entry level turbine. However, the included charge controller isn’t the greatest in times of low wind. 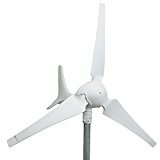 This 1200 watt rated residential wind turbine kit comes with a high-performance MPPT charge controller included. The charge controller is an essential part of the operation as it matches the voltage of the wind turbine to the batteries. The 3 blade turbine has a cut-in speed of 4.5 mph which means it will start producing energy at even lower wind speeds than its big brother model. The blades themselves have a diameter of 5.6 feet and are made of polypropylene and glass fiber, with a weatherproof seal. The kit has many safety features to protect the circuitry and hardware. These safeguards include voltage surge protection, battery overcharge protection, sudden gust, and high-speed wind defense, and an integrated automatic braking system. It comes with a manual brake switch too. The system is suitable for batteries with a capacity of 100 Amps or more. It is also suitable to be combined with solar panels to supplement your energy needs on days of low wind. The kit comes with an MPPT charge controller. These are the most efficient types of charge controllers and are especially effective in the larger wind and solar installations. The kit comes with a 1-year manufacturer’s warranty. Bottom Line: This kit solves the problem of finding a suitable charge controller for your installation. It’s really easy to set-up and is an ideal starting place for those just beginning their adventure with wind power. This model is slightly different from the others. It is a solar and wind combination that includes solar panels too. 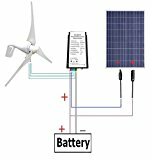 This kit comes with everything you need to get started apart from the electrical cables to connect the turbine and solar panels to the controller, a pole, and batteries. The model we have listed here is the smaller version, but it can be increased in size with a larger solar panel array. The controller is designed to auto-detect a 12V or 24V battery system. The wind turbine has a really good cut-in speed of just 5.6mph. This makes it good in lower winds. Having the options of solar energy and wind energy means this can generate energy at all times of the year, and at day and night. This comes at a great price considering all that is included in the kit. The turbine, controller, and solar panels are all included. This is a full home wind generator kit. It is marketed as being easy to install and can be used in conjunction with solar panels. It is made of a high-quality polypropylene and glass fiber construction, which is fit for any weather conditions. The kit includes an integrated automatic braking system and also a manual braking switch. It is rated for 600W power and 31mph wind speed. It has both 12V and 24V systems and features an auto-detection mode. The suggested battery capacity for this turbine is 100A or larger. The digital MPPT charge controller is specially designed to always generate the maximum power output and operates the safety features like auto breaking and battery over-charge protection. It has a really low cut in speed of 4.5 mph. This is the lowest of any model we have featured and means it is the best at producing energy at low wind speeds. This turbine also comes with an excellent one year warranty. 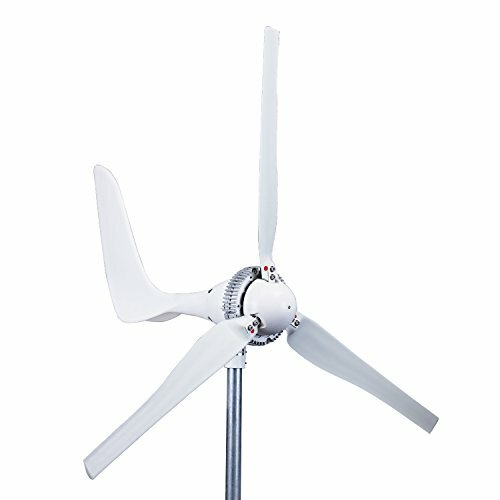 This is one of our favorite models that we have featured in our home wind turbine reviews. 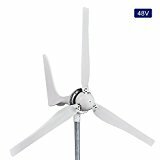 Bottom Line: If you don’t need the power output of the larger turbines then this is one of the best residential wind turbines in the smaller size. This is a residential wind turbine kit that can supplement with solar power too. It’s one of our favorite small windmill generators. 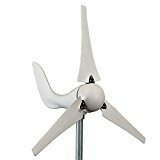 This Windmill 400 watt mini wind turbine for home use is ideal for supplying “off the grid” power on land or at sea. It has been well designed to survive all that nature can throw at it. It has a UV coating and will not be corroded by salt water. Furthermore, it can withstand strong gusts and high winds. It also comes with an integrated breaking circuit that means it will “switch off” when the batteries are fully charged. It has a rated power of 400W and fits a 12V power system. This turbine is ideal for battery capacities of 50A or larger. It has a decent cut in wind speed of 6.7mph which means it can still supply energy on calmer days. Windmill also offer a full one year warranty to offer some peace of mind during the difficult first year of operation. The Missouri Raider is American designed and made. The company (Missouri Wind and Solar) are knowledgeable and helpful with any questions you might have. This model comes in two choices of color (black and grey) and also two voltage systems (24V and 48V). The turbine tail and hub feature a heavy duty construction which will last the tests of time. With up to 1600W of output this is one of the more powerful turbines we have looked at. This means it also has a larger rotor diameter of 1.6m. It has an impressive cut-in speed of 6mph too, which makes it good in lowers speed winds. It also has a PMG (magnet) generator which ensures it runs smoothly and never sticks. The Missouri Raider is one of the larger wind turbines we have listed, but also one of the cheaper ones. It is a good value piece of kit. Bottom Line: This wind turbine for home use offers great value. It’s a pretty powerful residential turbine that doesn’t break the bank. Buying one of these devices is a big step with lot’s of planning involved. In this section, we outline some of the steps that need to be considered before you buy. They look very basic, but what’s going on “behind the scenes” is anything but. We’re not going to go into a huge amount of detail, but in this section, we’ll explain the basics. If you’re not much of a reader, then the video below does a great job explaining things. Wind turbines harness the natural kinetic energy that the Earth’s wind provides and convert it into clean electric energy for our homes. As the rotor blades are spun around by the wind, they drive a generator which harnesses the power (learn more about how wind is formed in our latest article). The wind turbine will create energy whenever the wind speed reaches the cut-in speed for the model. For example, a turbine rated with a cut-in speed of 7mph will only start producing electricity when the wind speed reaches this threshold. The turbine will produce energy anytime the wind blows fast enough. The energy is stored in deep cycle batteries, consumed, or fed back into the grid. Wind turbine generators can lower electricity bills by up to 90% if employed in the right circumstances. They’re not an ideal fit for most people though. You can find out if they’re right for you in the next section. There are two kinds of residential wind turbine kits that are available. Each has their own merits. Let’s take a look at each of them. The grid-tied system – this system is connected to the national electricity grid. This type of turbine system will help reduce your consumption of utility-supplied electricity. If the wind turbine doesn’t deliver enough energy then the grid makes up the difference. If the wind turbine makes too much energy then the excess can be sold to the utility. These systems make sense if your energy supplied by the utility is expensive, and their requirements for connecting your turbine to the grid are not too expensive. The stand-alone system – this is the off-grid version which interests those who want to become self-sufficient and produce clean energy. This version is usually used in conjunction with a solar electric system. In this instance, the wind turbine charges battery packs which store the electricity. The generator will produce DC electricity in each case. This must be converted to AC electricity before it can be used by appliances in the home, or put back into the grid. This is done using an inverter. Some wind turbines for sale will come as complete kits and include the inverter, but most are sold separately. What’s inside home wind turbine kits? Let’s break down the wind turbine into its component pieces. This should give a better understanding of how it operates. Knowing some of this terminology will help a lot when choosing the best home wind turbine for your needs. Generator – this is the part that creates electricity in the system. The motion of the rotors turning spins the generator which changes the kinetic energy into electrical energy. The generator is connected to the centerpiece of the blades and sits directly behind them. Brakes – the best wind turbine design will include both manual and automatic braking systems. Automatic brakes can be used in some models for when the battery bank is fully charged. The manual brakes are needed for maintenance or even emergencies. Batteries – an off-grid system will need a bank of batteries to store the electricity. The turbine will produce electricity whenever it spins above the cut-in speed. So you can stockpile this energy in the batteries for when it is needed. Lead acid batteries (deep-cycle) are the most common kinds to use. They can be wired in series or parallel to make a battery bank. Controller – the charge controller is basically a safety feature that looks after the battery bank. It monitors the amount of energy stored in the batteries and protects the batteries from overheating when they are fully charged. When the batteries are fully charged the controller diverts the energy to the dump (see next component). We recommend MPPT charge controllers. They are a bit more expensive than PWM controllers, but they are much more efficient. Dump – when the battery pack is fully charged, the turbine may continue to turn. Without a dump, the energy has nowhere to go and the system will run unloaded. This means it might spin extremely fast and may break. The dump protects the unit when the batteries are fully charged by ensuring there is still enough resistance in the circuit. Inverter – the electrical energy made by the generator needs to be converted from DC to AC before it can be used. There are many good reasons to get involved in renewable energy sources like wind. People usually choose wind energy for environmental reasons, but other reasons include cheaper energy and a desire to be more independent. It’s important that people remain realistic with their expectations about wind energy though. Despite being around for a long, long time there are reasons why wind energy is not all that popular. For a start, it is completely dependent on the consistency of wind. If you live in a place where average wind speeds are not high, then installing a wind turbine would be completely impractical and a total waste of money. Actually, that means wind energy is not a feasible energy source for most of us. Take a look at the map below that gives the average wind speeds across the entire country at 80m in height. If you live in a green area then you should forget about it right now (unless you live on a raised area). You can get all this information from the NOAA website. It’s important to remember that the map illustrates average wind speeds and that the landscape that immediately surrounds your home will dictate whether wind power is a viable solution for you. So, how can you tell if wind is right for you? How can you work out the residential wind turbine cost over time? For a home wind generator kit to run efficiently and supply you with a decent amount of energy, the location has to be ideal. The stronger and more consistent the wind, then the more energy you will have. This means that a 10 mph wind will yield 8 times as much power than a 5 mph wind. In fact, a wind speed increase of just 1.3 mph will create double the amount of energy. Furthermore, by choosing a place for your wind turbine that has 10% more wind, you will yield 33% more energy. This relationship isn’t an exact scientific one, as there other other variables that will affect the amount of energy harvested. But, it gives a great indication of the amount of power you might produce in a given area. The map above gives a great indication of general areas that receive a good amount of wind, but the immediate surroundings are vitally important too. A wind turbine must be able to function unimpeded from trees, hills, buildings or anything else that might affect the wind. Good sites for wind turbines would be hilltops, plains, fields, and ocean fronts. Anything close to a forest, city, or valley would run the risk of not getting a strong enough wind. The easiest way to know for sure if your local weather is ideal for a kinetic wind generator would be to measure it yourself. A digital handheld wind meter can be purchased on Amazon. To really get meaningful results you would have to monitor the wind speed regularly over a long period of time. Otherwise, information might be available from local meteorological sites. This data wouldn’t be as accurate as collecting your own “on-site” data but would give a good indication. They might even keep historical wind speed data which would be a really useful resource. If after all your research, you find that you live in an area with above average wind speed then you can start thinking about wind turbines for sale. They are a great solution to off-grid energy headaches. Generally speaking, they work well in combination with solar panels but can make sense on their own if your electricity rate is currently very high. Hot, sunny days don’t tend to be very windy, while those cloudy, sunless days are often much windier. 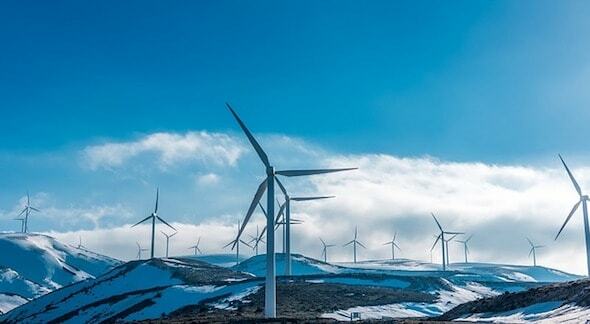 Wind turbines produce most of their energy in the winter, while solar panels do most of their work in the summer. A combination of the two is a great energy providing relationship for the environmentally conscious, or someone seeking to go “off the grid”. We’ve talked a lot and provided a lot of information so far. So, here’s a quick run-down on the key points to take away from this. These are the positives and negatives of installing a wind power system. The installation procedure for wind turbine kits isn’t a simple one. You’ll need a decent understanding of electrics so that your system runs efficiently, and more importantly, safely. Furthermore, most kits don’t include a pole to mount the unit on. This is something you’ll have to consider too. In this section, we list a few things to consider before purchasing small windmill generators. Make sure you know the installation site inside out. Besides keeping the wind turbine clear of any physical wind obstructions like trees and buildings, make sure you know about the prevailing wind directions. The wind turbine needs to be situated upwind of any obstructions. It should be at least 30 feet higher than any obstacle within 300 feet. Plan for maintenance checks. Your wind turbine should last for at least 20 years, but it will require maintenance checks over the course of its life. Make sure that it can be easily lowered or reached for maintenance. Consider the amount of wiring used. Quite a lot of electricity can be lost due to the resistance of the wire. Try and plan the installation site to keep the length of wire between the turbine and batteries to a minimum. If you have to use a large length of wire then try to invert DC (direct current) to AC (alternating current) as the losses will be less. How will the turbine be supported? – Most manufacturers don’t supply a pole to attach the wind turbine to. You will either have to buy one, make one, or attach it to a roof or other surface. Ensure the whole set-up matches. If you choose a 12V wind turbine then make sure you also choose a 12V inverter and controller to match it. Likewise, if you choose a 24V or 48V system make sure they are all the same voltage. The dump load must be exactly the same as the power rating of the turbine too. If you have 400W rated turbine, then the dump load must match it. Before installing a grid-tied system you will, of course, have to get permission from your utility company. An off-grid system will also require batteries to store the electricity. They use deep cycle batteries, which are typically lithium-ion or lead-acid. Most small wind turbines will require 12V batteries. These can be combined to make battery banks. These offer more energy storage space. Both styles will require an inverter to change the current from AC to DC before it can be used. Wind turbines have many moving parts and have maintenance checks performed on them every 6 months. With proper maintenance and care, a wind turbine should last 20 years or even longer. Check the blades and nose cone for any superficial damage. Damaged blades decrease efficiency and can be dangerous. Check the blades nose cone are balanced and secured tightly. Check the nuts and bolts. Clean any dirt or residue from the blades and cone. Check that the electrical connections are secure and corrosion free. Check the condition of the battery bank. Use a multimeter to test the batteries. Clean and inspect the connections. Perform a local wind survey. This is an essential step and will show whether a turbine is a feasible prospect or not. You can do this yourself using a wind meter. You would need to measure the wind at the prospective installation site on a daily basis for a long period of time (+1 year) to get worthwhile data. The other option is to use public information collected by meteorological agencies. Know the cut-in speed of the wind turbine. The cut-in speed is the minimum wind speed that is needed for the turbine to start producing electricity. If the wind speed is below the cut-in speed then the turbine will not produce any energy. It’s no good getting a model with a 9mph cut-in speed if your average wind speed is 8 mph. That brings us to the end of our guide to the best home wind turbines. We hope that you’ve found our guide of value. We regularly post articles about the things that can make living off the grid that little bit easier. Make sure to follow us on Facebook to stay informed of all the latest news. There’s a link to “Like” our page on the right. Let us know how your turbine project is going in the comments down below. We’d love to hear from you! Don’t miss our guide to composting bins to see how you can reduce your carbon footprint even further.